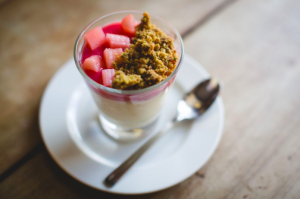 The Riverbarn has won Best Restaurant at the Muddy Wiltshire Awards, and boy does it deserve that accolade. 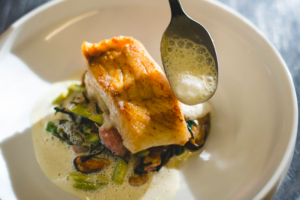 When we at Muddy were invited to stay and dine with the winner of the highly coveted Best Restaurant in Wilts Muddy Stilettos Award, we jumped at the chance. And lordy, we were not disappointed! Now, this baby is described as a Restaurant with Rooms. Which is exactly what it is, except – ooh la la! – said restaurant and rooms are just divine. Packed with old world charm, this is a real pit stop for gastronomic know-it-alls. Proud owners of an AA Two Rosette Award for Culinary Excellence, plus of course our very own Muddy Award for Best Restaurant, this is a true family run business (mum and dad front of house, sons in the kitchen whipping up the magic) and I have to say, the result is near perfection. The food is sublime, the welcome warm, and the accommodation dreamy (see what I did there?). 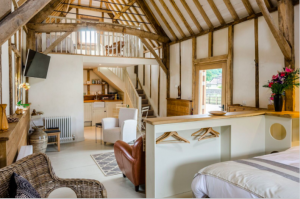 Stonehenge, Stourhead, Longleat and Salisbury are all nearby and if you’re here to snoop around the historically fascinating William Beckford or visit the ruins of Old Wardour Castle, The Riverbarn is an ideal place to spend a few days exploring. Relaxed luxury, I’d say. The chef brothers create stylish and imaginative dishes which have won the restaurant admirers plus a strong local following. The menu is small yet varied, relying on local, quality ingredients. 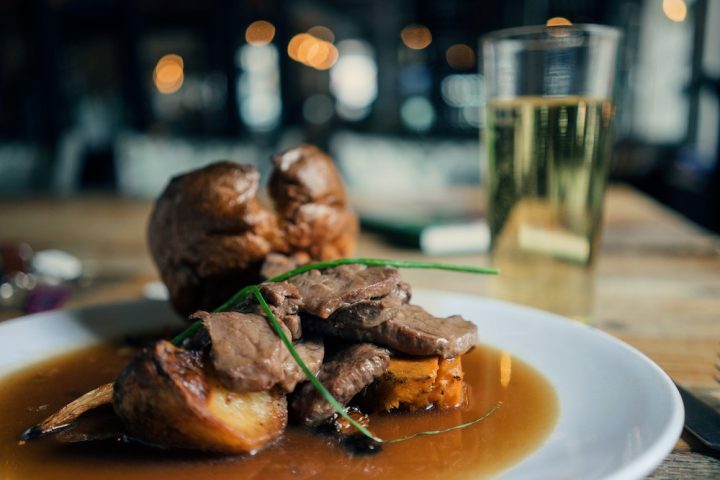 Their popular Tasting Menu events are held every other month and they do a bonzer Sunday lunch. This place is a home from home, I’d go so far as saying – Ian and Jill welcome you into their little corner of the world and you leave feeling very special. What is it with kids and mezzanine levels – they love them! The Granary, a short walk away, was an ideal resting spot for my daughter and I, especially as we were given a wind-up torch for the walk home which caused much excitement. 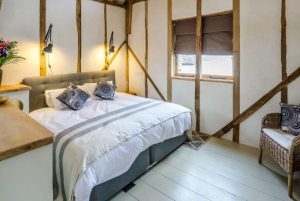 The Riverbarn also has three guest rooms adjoining the restaurant but this beautifully restored thatched barn is just stunning, with modern touches and a few flashes of high end design. A gorgeous bathroom (always love a bathroom, me) and tasteful kitchenette, plus games, books and Netflix. Done. We’re bang in the middle of Wedding Country here so if you’re in the area for a friend’s nuptials (they hold dozens on the Fonthill Estate itself) I’d definitely recommend staying here. The food here is excellent. Well, it blooming should be, seeing as it won Best Restaurant in Wilts! 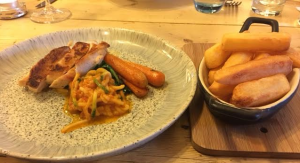 Chefs Jonny and Tom Sutcliffe whip up a storm in the kitchen and although it is aimed at customers with sophisticated tastebuds and deepish pockets, it is still good value for money in my book with a prix fixe menu for £20 for 2 courses or £25 for 3. 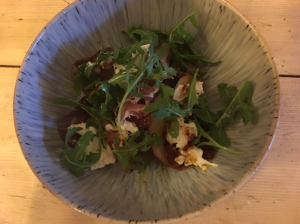 I started off with a Coppa ham and peach salad with burrata, rocket and sun-dried tomatoes, which sadly I had to wolf down as accompanying Mudlet was starving and not very impressed that she had to wait for me! But it was truly delicious. 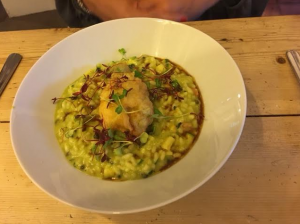 For mains, I took in the courgette risotto with ricotta stuffed courgette flower and pine nuts, and Mudlet loved her roast breast of chicken and chips. Although she sneered at the Provencal courgetti on her plate, I enjoyed finishing it off for her. I forgot to take a piccy of the peach crumble for afters as I’d had two glasses of the good stuff by then (a divine rosé) but I do remember that we both loved it. 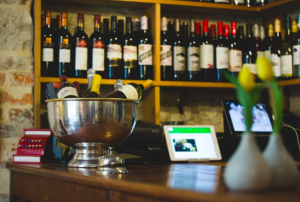 All in all the grub is equal to any posh top notch gaff, albeit without the starchy white tablecloths and smirking sommelier lurking at your shoulder. Which in my book, equals perfection. Yes. My daughter loved Ian and Jill and their warm hospitality and, in particular, the chips. The best apple juice she’s ever had, she declared, and then repeated this assertion when it came to the sausages the next morning. There were a few other children there, which is also a good sign. 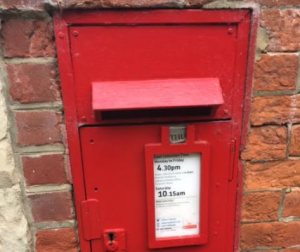 There are enough twists in this quirky little restaurant to keep them entertained, and she loved the fact that The Riverbarn is actually a working registered Post Office two days a week! Yep, there’s loads to do in this beautiful part of Wilts. There are lots of opportunities for walking in the local area including a 6 mile route around the Fonthill Estate, plus pushchair friendly and dog friendly walks. 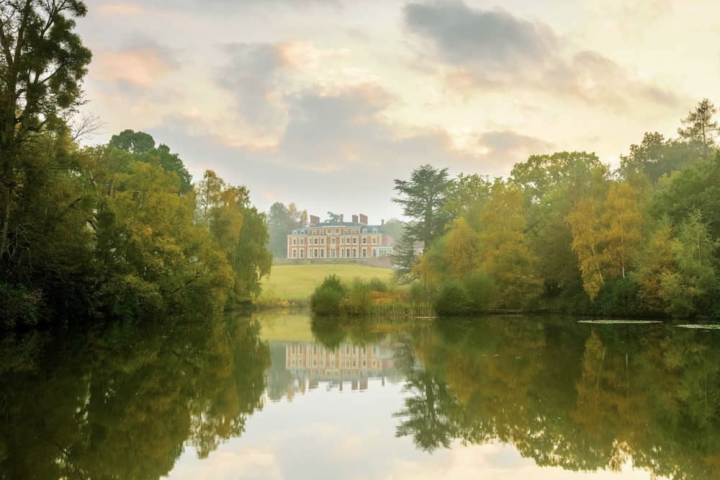 National Trust Properties nearby include Stourhead House and Gardens, Dinton Park and Philipps House, while English Heritage properties feature Old Wardour Castle, the famous White Horse and Bratton Camp, Old Sarum and Nunney Castle, all within spitting distance. Salisbury and its impressive cathedral is about a half-hour drive, Stonehenge only around the corner, and you can get to the shopping mecca of Bath within an hour. Good for: Family stopovers or quiet nights away from the Mudlets. 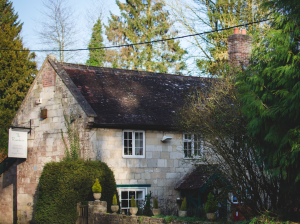 The perfect spot to explore the Wiltshire countryside. Even better for: The chance to stuff your face with divine grub at every meal. Not for: Cheap and cheerful. It’s a step up from that. The damage: Double rooms from £75, The Granary (sleeps 4) from £175 inclusive of breakfast.